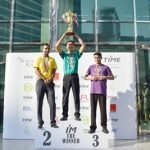 James Dunuan, from Grand Gourmet, beat off stiff competition to win the third annual TIME Hotels Dubai Waiters’ Race, which took place on 23 November 2018. Co-ordinated by TIME Oak Hotel & Suites – the only CSR labelled hotel in the Barsha Heights community – which also acted as the starting point for the hotly contested race, waiters had to negotiate the course through the Byblos Hotel and the Auris Metro Central, before sprinting back to the start line – a circuit of 720m. Sponsored by Fit Fresh, NRTC, Rich Printing Press, Masafi and Water Hygiene Technologies – the 8am start didn’t deter entrants, with a total of 10 competing hotels, each fielding a waiters-only team of five runners. Commenting on his win, James Dunuan, said: “I am delighted to be taking home the trophy for the individual race. My team-mates and I have been working hard and obviously training every day because it’s our job. 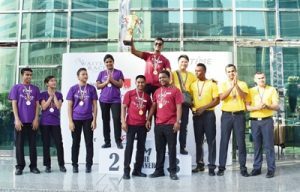 In the individual race, Mohammed Mozabeer from Citadines Metro Central Hotel finished in second place, and Ram Kumar, from Flora Park Hotel, came in third. The Relay Race was won by JA Resorts & Hotels, followed by Flora Park Hotel, with Citadines Metro Central Hotel in third place.